Hello and welcome to my blog on the Marsupials and Monotremes Blog Tour! This is my first blog post ever and I am very excited and honoured to be a part of showcasing these beautiful fabrics by the very talented contemporary Australian fabric designer, Amanda Brandl. Marsupials and Monotremes is Amanda’s third collection for Kennard & Kennard and it is a unique collection featuring both Australian flora and fauna. You will find waratahs, gum leaves and blossoms, grevilleas, platypus, echidnas and wombats, how delightful does all that sound? The bright and gentle colours coupled with the soft and silky premium feel of this fabric range make it perfect for any sewing project. I will be showcasing two of my projects in this blog post. The first project I made was a shirt, using the Echidna Shuffle Cream print for the main part of the shirt. I chose this as the main because it has such a gentle feel to it, nicely suited for the tender-hearted little boy I was sewing for. The flora on this fabric is very detailed and beautiful and when I first received this fabric, I was so excited to see that there were also ants for the echidnas on this shirt! What wonderful little detail! 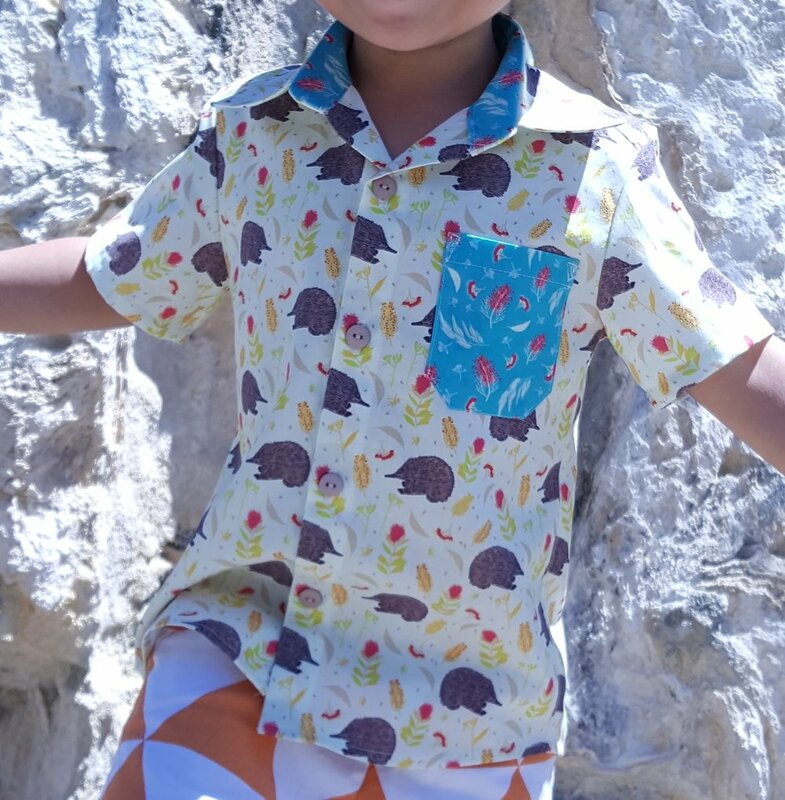 Grevillea on Aqua was used as the coordinate because I wanted the pocket and collar stand lining to stand out a bit more, giving the shirt a pop of colour and fun. I used the Troop Shirt pattern by Tadah, which is my go-to pattern for boys’ shirt for the past four years. 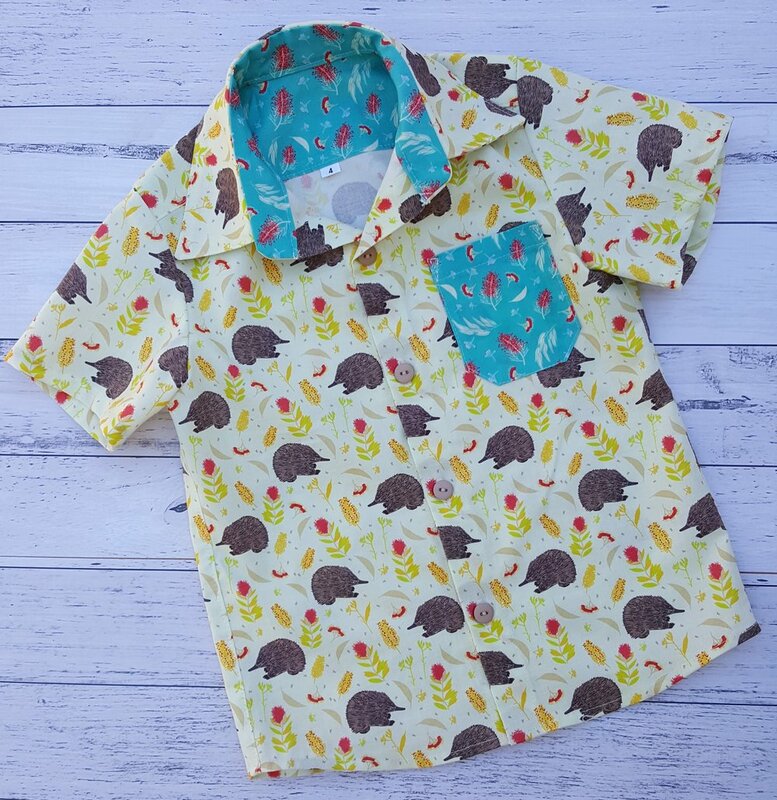 I have two boys aged 8 and 4 and they absolutely love dressing up and looking smart in shirts with cool and unique prints, so it only made sense to sew up a Marsupial and Monotremes shirt! For my second project I made a girls’ pinafore dress using Echidna & Wombat Green as the main part of the dress. This lime green colourway is bright, fresh and happy! My photos do it no justice, you need to see and feel it in real life. If you look closely at the amazing detail, it’s as though the fabric is just bursting with joy, like those pretty specks of colour you see appearing when spring arrives. 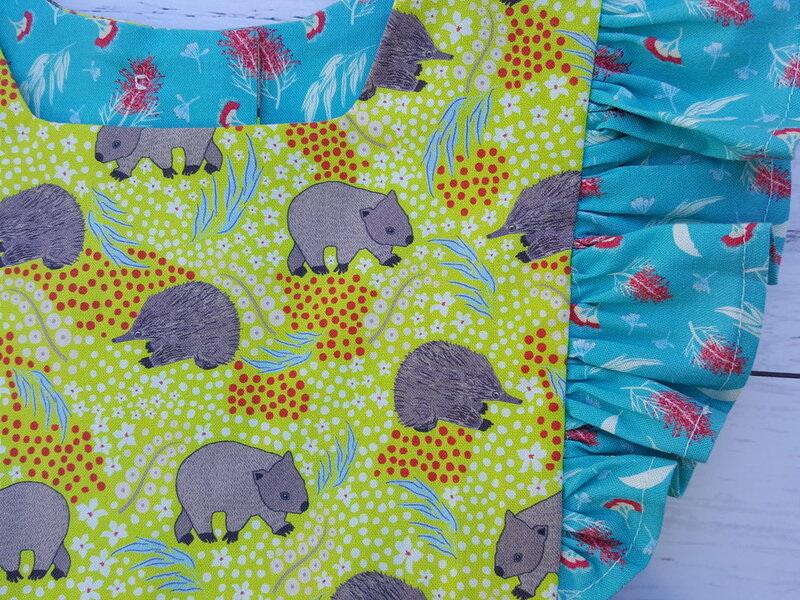 Then there’s those adorable echidnas AND wombats splashed all over it, this fabric can’t get any better. For the ruffles and skirt trim I used Grevillea on Aqua again, I really love this rich aqua colourway with red grevilleas. The dress pattern is Bebekins’ Polly Pinafore pattern as I adore classic looking dresses on girls. I like how it is a different colour and print for a dress. 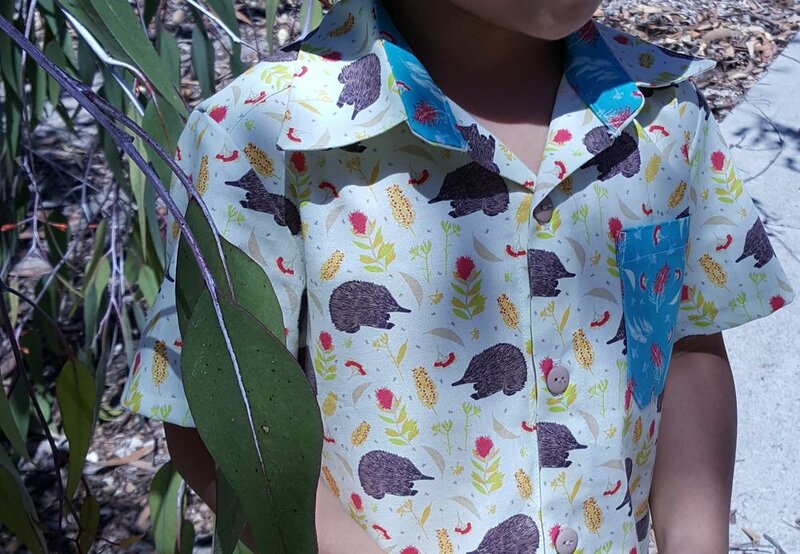 How many little ones get to wear echidnas and wombats? 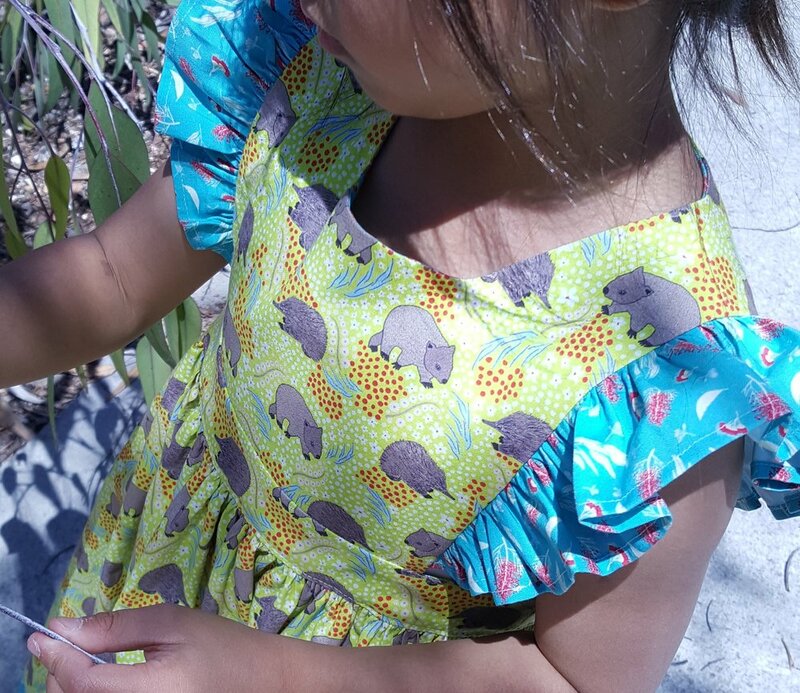 It is the perfect fabric for my daughter who developed a fascination with echidnas while in Pre-Primary thanks to her echidna-loving teacher who taught them all about echidnas, so I know who to sew for next with this collection! Amanda has captured these fascinating Australian animals beautifully in her Marsupials & Monotremes collection. I look forward to seeing the many creations these fabrics will inspire! If you would like to purchase some of this fabric collection, we will have it in stock by the end of this week. Please visit our Amanda Brandl section of the website to purchase and enter the code AUSTRALIANA at checkout to receive 10% off all Amanda Brandl fabrics (Taking Flight, Bush Gum Blossoms and Marsupials & Monotremes). This discount will be available until the end of the blog tour. Do check out Kylie’s, Wombat and Poss, adorable bibs and shorts from yesterday’s blog hop. Her creations have certainly motivated me to sew up some shorts! Then follow along to be captivated by the creations by Anorina from Samelia’s Mum. I look forward seeing what she has made with this beautiful and very inspiring collection. To see the full blog tour schedule for this Australian animal fabric collection, please go to Kennard & Kennard or visit amandabrandl.com.au.